I got a tattoo a week or so ago. It’s a tattoo I’d been wanting for awhile now. For various reasons, Zach and I agreed now would be the perfect time to get it. And so I did. This picture was taken right after it was done. It’s healed now and looks better, but this is the only good picture I have of it. It’s actually straight, though hard to tell depending on how I’m standing (I had debated getting it straight or having it go along the angle of my collarbone, I know, such difficult matters I consider). Why did I get this? Well firstly because it’s true. For a long time I doubted it. You know? Don’t we all? But we are called God’s beloved many times in the Bible (Google tells me 70 times) and I really love that idea, that God truly and sincerely loves me. When I look back at various moments in my life I realize that the times when I’ve messed up severely are the times when I’ve forgotten that simple truth. 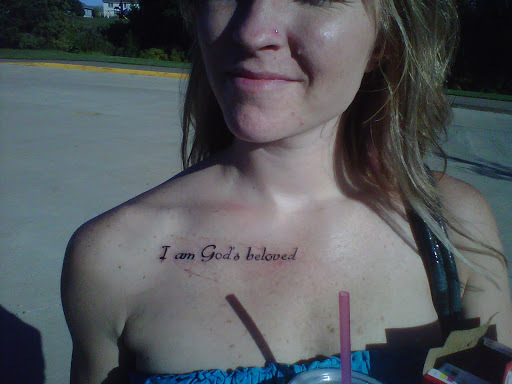 That I’ve doubted or outright disbelieved that God could possibly love me so much as to call me His “beloved”. But it’s true. And perhaps for the first time in my life recently I get what that fully means. I get that by knowing I am God’s beloved within the deepest parts of me it will change the way I treat myself, it will change the way I treat the people around me. It will allow me to move through humanity without skin. To allow love instead of fear to seep out and cover the people I meet and love every day. I’m probably not going to succeed every day, I know that. But at least it still remains true every day. My other debate before the tattoo? Part of me wanted to get it so that I could read it when I looked in the mirror-making it illegible to you all. Then I decided on getting it so you all could read it. Yeah I wanted you to read it. Because I figured if someone saw me every day (say, taking a class from me) then maybe one of those days they’ll actually accept it. And internalize it. Or maybe one of those days they’ll just need to hear it. Maybe you only ever see it/me once? Well perhaps you still needed to hear it just that one time. You’re still God’s Beloved. And so am I.
Ballsy, you are ballsy. Someone is near my neck with a needle, I would turn into a caged rabid animal. Love tats, hate needles (you see my conundrum).Looks great! LOVE this. Every aspect of it.